The Jankara estate was founded in 2006 when Renato and Angela Spanu first purchased 21 acres of untouched hillside land in the prestigious vein of San Leonardo within the highlands of Gallura. In 2008, The Spanus planted 11 of the original 21 acres with the Vermentino grape. In 2013, Renato and Angela Spanu were joined by their long time friends and world class Chef and Restauranteurs Angelo and Denise Elia, owners of the famous “Casa D’Angelo Restaurants” in South Florida, in a new partnership that will help propel Jankara to new levels. The Estate is located between the towns of Luras and Sant’Antonio di Gallura near Lake Liscia, at about 300 meters above sea level and about 25 minutes from the prestigious Costa Smeralda beaches. A deep passion for Sardinia and particularly Gallura, the homeland of Renato, brought them to pursue this fantastic dream of realizing a world class wine and promoting the beauty and richness of the Gallura granite mountains and soils to the world. After much sacrifice and very hard work, the couple along with the help of their new partners Angelo and Denise have come to create Jankara; a true expression of their love of wine and the amazing ancient land called Gallura! The Jankara Logo is an ancient crest of the “Gallo di Gallura” or “the Rooster of Gallura” which dates back to the year 1116 and belonged originally to one of Gallura’s first Judges/Kings Costantino Spanu, who besides having the same last name as Renato and Angela also coincidently hails from the same town as Renato’s Grandfathers family called Luras. 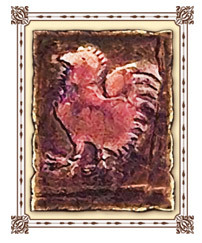 The Rooster became the symbol of Gallura after a pact was formed with Pisa during the rule of Costantino and to this very day symbolizes the ancient land of granite mountains in northeastern Sardinia. It is because of this symbolism and love for Gallura that Angela and Renato Spanu decided to adopt this ancient tablet to represent their dream “Jankara”. Renato and Angela buy the land on which Jankara will be founded. The first 4 hectares of grapes are planted. 28 September, 2010: an unforgettable day: our first harvest and the birth of Emma Leah, Renato and Angela’s daughter. Angelo and Denise Elia, owner of the prestigious “Casa D’Angelo” restaurants in Florida, join Renato and Angela aboard the Jankara adventure. First vintage for Lu Nieddu, our red wine, made with heirloom grapes from Alta Gallura, growing in an 80 years old vineyard. Jankara Vermentino di Gallura Superiore 2016 is awarded as the best white at the Porto Cervo Wine Festival.